Microsoft dropped the price of the 32GB Surface RT to £279 from £400 in the UK, with the 64GB model's price down by the same amount to £359. And in the US, Blackberry has cut the price of the Z10 phone to as low as $49 with a contract - down from $199 four months ago. Both firms have developed the devices to show off their latest software. And both have tried to compete with Apple, Google and Samsung on smartphones and tablets - with limited success. "It's a big deal for both companies," Tony Cripps, a telecoms analyst at Ovum, told the BBC. "Competing with the Apples and Samsungs of this world is tough, and it's a difficult climate to put out high-end products when the market is so dominated by a couple of players." In the US, the cheapest Surface tablet went down to $349 (£230) from $499. Blackberry in particular is battling to revive its share of the smartphone market with the touchscreen-only Z10, which shows off its new BB10 operating system. Users can get the Z10 through US carriers AT&T and Verizon Wireless, for $99 with a two-year contract, but the phone costs $49 with a contract at retailers Amazon and Best Buy. It is not clear whether the price cut has been implemented to people looking to get the phone on contract in the UK. The company reported an $84m loss for its last quarter and refused to say how many devices running BB10 it sold - but it sold fewer phones in those three months than in the same period the year before. Blackberry has said it shipped one million Z10s in the first three months of 2013. "For Blackberry, it really bet the farm on its new BB10 operating system and it needs to regain market share in smartphones," Mr Cripps said. "In that sense, the Surface's success is perhaps not quite as important for Microsoft but if they want Windows 8 to be a key driver for the future, they need to get it into the hands of as many people as possible." Microsoft's Surface tablet is intended to challenge the iPad and Android-based tablets and runs Windows RT, a slimmed-down version of its latest Windows 8 operating system. Recent figures from analysts IDC show that 49.2 million tablets shipped in January, February and March - and about 900,000 of those were Surfaces. Other Windows-powered tablets totalled 1.8 million units sold across all vendors. Apple's iPad and iPad Mini accounted for 19.5 million of tablets sold. "We've been seeing great success with pricing and cover promotions over the past several months on Surface RT in the US and other markets," a Microsoft spokeswoman said. "People who buy Surface love Surface, and we're excited about all those additional people out sharing their excitement for Surface with other people." 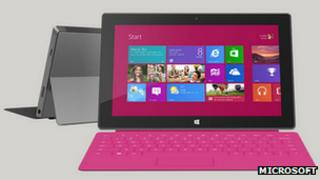 Microsoft also offers the Surface Pro, which runs the full version of Windows 8 and starts at $899 for the 64GB model. It has not had its price cut.